Canada and Portugal tied for last at Hong Kong, both getting the minimum 1 series point. Portgual aren't a core team and were invited to the tournament. The last time Canada came last in a tournament was in April/May 2016 at Singapore and Paris when the team hit a low. That was when Liam Middleton was coach, he was subsequently given the heave-ho. The team has never experienced a last place finish under coach Damian McGrath. The result puts Canada in the relegation yellow zone, not in immediate danger like Wales, Japan and Kenya who are in the red zone but if the patterns at this tournament repeated three more times it could be dire. Canada are at 36 points with Kenya 23, Japan 21 and Wales 20. Wales currently hold the relegation position. Japan gained +6 on Canada this tournament, if they repeated that 3 times or exceeded that they would catch Canada. If any of the teams made the Cup round, and Kenya is a possibility, then they would make ground on Canada quickly. The bottom line is Canada can't afford another last place finish over the remaining 3 tournaments. The draw at Singapore is not kind, a harsh pool for Canada. They face South Africa, Fiji, Scotland. The chance of advancing to the Cup round in this group on current form is low. Rugby Canada spent a lot of money and focus on getting its XVs team to the World Cup, have they considered the consequences of hosting the Vancouver 7s tournament without Canada as a core team. It's time to dedicate some resources to the pool of upcoming 7s development players who are itching to get some World Series experience. As for the games themselves, Canada were out muscled by Kenya in the Challenge QF, Kenya winning the breakdown consistently and stealing ball. Result was 19-0, the game wasn't close. In the 13th place semi-final Canada lost to Wales 29-14, 5 tries to 2, with Justin Douglas scoring both. Full match videos are below. Canada have made the Cup round once this season, that was in Hamilton, NZ. There are three tournaments left. In 2018 Canada made the Cup round three times, in 2017 they made the Cup round six times including winning Singapore. The program has gone a bit stale and needs to refocus. One area on the field it's very noticeable is the lack of intensity on defence. Canada's defence looks paper thin, when the first defender is beaten there's virtually no cross cover defence being provided. That's not a skill issue, that's a state of mind. In the France match Canada were down by 3 tries before Conor Braid put one up for Canada. France replied immediately and Canada closed out the match with a consolation score from Isaac Kaay, 24-12 final. All 5 subs got into the match. Next was Portugal, a team that isn't on the circuit and who didn't make the qualification tournament. The four teams vying for next year's series after making the semi-finals of the qualifying tournament are Ireland, Germany, Chile and Hong Kong. 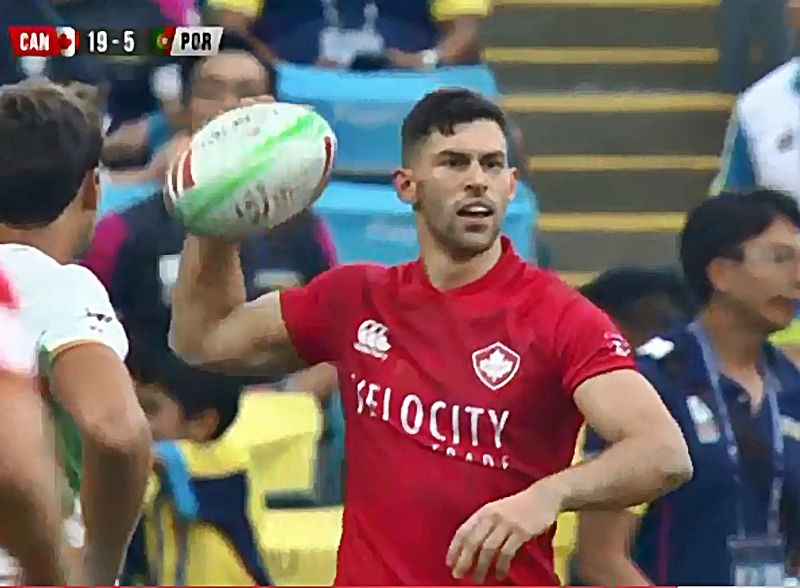 Portugal scored first in the match, Canada replied with 3 tries by Jones, Hirayama, Douglas before Portugal made it close with a try at the 12th minute. Canada closed it out for a 19-12 win. Canada now face Kenya in the Challenge QF. An interesting match up as both teams had labour issues, Kenya replaced their striking players, Canada worked through the issue although it's not completely settled. Kenya just came to a working agreement with the striking players before Hong Kong and six of the senior players have returned. Now the teams face off in the Challenge round, one big difference is Kenya is dangerously close to relegation only 4 points ahead of Japan who are in the relegation position. Canada are a more comfortable 21 points out of the relegation zone. Canada dropped their opening match 3 tries to 2, 19-14 to Argentina. Their job of qualifying for the Cup round now is more difficult as they have to defeat France in their next match to have a chance. Argentina started with more intensity, Mullins knocked a ball on, Mike Fuailefau got held up in a tackle, Canada were giving away easy possession and Argentina were looking sharp. They scored 4 minutes into the first half, won the kickoff and scored again. Canada were getting a couple of 50/50 calls from the ref going against them as well which didn't help but it was now 12-0 for Argentina. Canada won the restart but Mullins again dropped the ball to turn over possession, he wasn't haven't a good day at the office. Hirayama picked up a yellow for knocking down a pass and Canada will start the second half down a man. Phil Berna comes onto the field for Mullins. Argentina scores early and are up 19-0. Andrew Coe comes on, Luke McCloskey goes off, Admir Cejvanovic comes on and Mike Fuailefau goes off. Off the subsequent scrum Hirayama dishes off to Justin Douglas who scores Canada's first try. Argentina also get a yellow card on the play. Canada now have two and half minutes to score two tries. Canada get a try off the kickoff from Braid, they now have less than two minutes to get the winning try. Unfortunately they run out of time and Argentina win. A poor start for Canada may give coach McGrath something to think about when he names his starting seven for France.